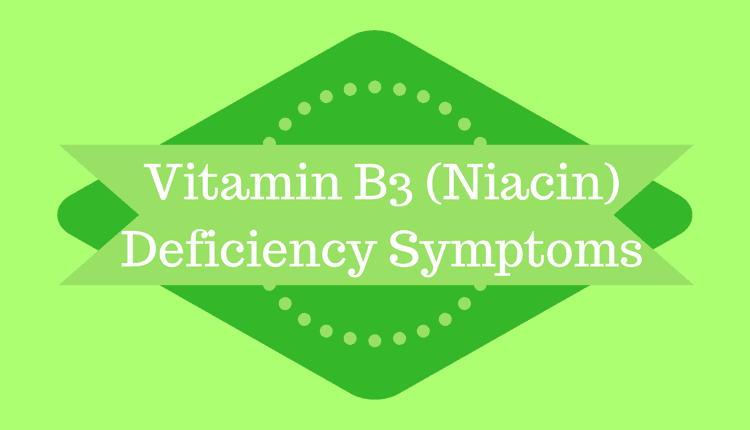 The symptoms of Niacin Deficiency or Vitamin B3 deficiency include cognitive decline, low energy, depression, photosensitivity dermatitis, indigestion, fatigue, canker sores, vomiting and pellagra. Niacin is required by the body for the proper functioning of the gastrointestinal system and nervous system, to boost energy levels and to enhance skin health. Having too little of this vitamin in your body can be a cause of being tired frequently. Lack of niacin can impede normal metabolism in healthy individuals. Without niacin the carbohydrates, protein and fat, which you get from your food do not get converted to energy. This creates a ‘low energy state’ in your body and you end up feeling tired and less active. Eating a diet rich in niacin can enhance your energy levels and make you more active. Not getting enough vitamin B3 or niacin can have mental consequences. Lack of serotonin, a brain chemical can impact the mood and social behavior negatively. It is further believed that a low level of serotonin is associated with depression. Literature has found that deficiency of niacin induces photosensitivity dermatitis, which cause red rashes on the skin when exposed to the sunlight. A lot of inflammatory compounds are involved in this process which further enhance skin inflammation in the absence of niacin. Deficiency of a B-vitamin niacin causes digestive problems such as diarrhea. Niacin is required for the proper functioning of the digestive tract. Besides diarrhea, low levels of niacin can cause nausea, vomiting, abdominal pain or cramps and poor appetite. All the above-mentioned symptoms are reversible if treated correctly with a niacin-rich diet or niacin supplements.